Where is the best place to find the best digital photography book? This article will help you find a book that will ramp up your photography to a new level. It is always a fun adventure to go to bookstores and pull books off the rack and flip through the pages. You get a good feel on how the book is laid out, the type of photography it's about. You can scan the table of contents, gaze at the printed images and even read a bit of the content. But what about buying a digital photography book online? How do you know if it's any good if you can't flip through it? Well, actually you can to some degree. It's really easy now to browse on-line without getting out of your computer chair and go book hunting by traipsing off to the local mall or shopping center. Many of the online book sellers let you take a peek inside the as part of your online browsing experience. At the traditional book store, you can't benefit from reading the thoughts and opinions of other readers who have already purchased your book. With online book searching you can read dozens (sometimes hundreds) of reviews on any photography book you're considering. Rather than depending on any hype put out by the author or publisher, you can;t get the thoughts of readers who have already bought the photography book you're considering. This cover photo on the left is from a book by Jack Ikinga called "Capture the Magic: Train Your Eye, Improve Your Photographic Composition." 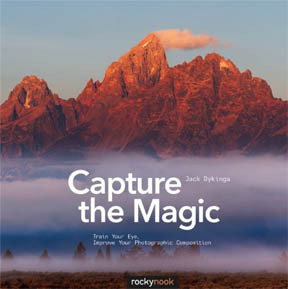 The cover reveals that it's a book on landscape photography. As of now 96% of the reviewers on Amazon give this book a 4 or 5 star rating. That's virtually unheard of for a book on digital photography. If you're looking for tips on exposure, shutter speed and camera settings, this likely is not a good book for you. If you read the various reviews by buyers you'll alrady know that ahead of time. 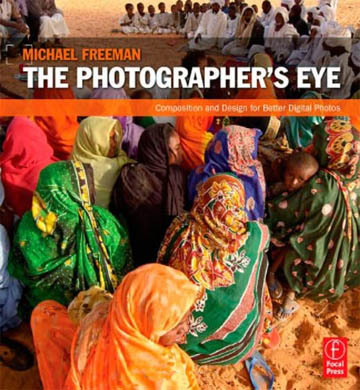 This particular digital photography book does have some instruction in the form of the author's thought process behind composing and taking of a good number of the photographs. It might be more accurately classified as an inspirational book of photography with learning by evaluating spectacular photographic examples as the mode of instruction. Because of the sheer volume of books sold, you would think that a book-selling specialist like Barnes and Noble would supply the best reviews on digital photography books. Actually, Amazon blows away Barnes&Noble in the number of books sales. Why? Well that's an article for another day. Amazon is also the clear leader in the number of online book reviews submitted by readers. Here is an example to illustrate the difference. 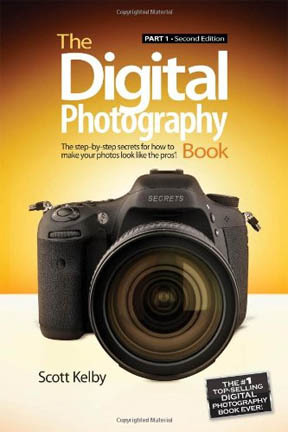 Take a look at Tony Northrup's very popular DSLR book "How to take stunning digital photography." Barnes and Noble has 6 reviews of this book (at the time this article's writing). Amazon has 441 reviews of the same book . The length of the written reviews on Barnes and Noble are 2 lines of text. The reviews on Amazon are several times longer, too many to calculate exactly. The photography book reviews are quite useful in several ways. They reveal what readers like and dislike on several different aspects. You can gain a feel whether the book is an actual "how to" book with step by step instructions or if it's more of an inspirational book. That's a good way of knowing if it's the top digital photography book for your situation. Some digital photography books give the technical details of aperture, shutter speed and lens choice and give detailed reasoning behind their uses in sample photos. Some books are built with the beginner in mind and some are written with advanced techniques. When choosing the best digital photography book for your interest it is a good idea to think ahead of time what specific knowledge or inspiration you are seeking. As I've confessed elsewhere on this site, I am an Amazon junkie, a frequent Amazon review reader and an Amazon Prime member. No I don't work for Amazon, but I do receive a small commission, a little thank you, when I refer shoppers to their site. Here is the link to get some specific reviews and opinions on many Digital Photography Books on Amazon. You've heard the saying you can't judge a book by its cover. Digital photography as a topic is always changing in some respect due to the fact that photography is such a technology based endeavor now. If you are looking for general advice on dslr or point and shoot cameras then it would be advisable to get a fairly recently written book. I purchased one of Scott Kelby's books on Photoshop CS for digital photographers and it was excellent. I got a lot out of it and it was well worth the money. It still has value, but it was published in 2003 so it's not as relevant now with some of the techniques written about. Scott Kelby is very knowledgeable, very experienced, and very helpful to photographers wanting to improve their photography. Here is his author's page: Scott Kelby. On the other hand, photography books on composition and lighting have a longer shelf life. Those aspects of photography don't change as quickly. If you use a little focused concentration when studying photography techniques and remind yourself to make it a fun experience, you will learn so much quicker. Have a blast looking for the best digital photography book!